The world's first 100% catenary-free tram line began operation in Dubai on Wednesday. The six-mile line, featuring vehicles manufactured by Alstom Transport, will serve the Al Sufouh, Marina and JBR areas, which are experiencing high-end urban development. The full system project, awarded to Alstom1 by Dubai Roads and Transport Authority (RTA), was launched to foster multimodal transportation use and to reduce traffic congestion and pollution. This first Tramway in the entire Gulf region is expected to serve about 27,000 passengers per day and is anticipated to reach about 66, 000 by 2020. “The tram for Dubai, which we are proud to have handed over ahead of schedule, illustrates Alstom’s strategy to serve all markets with a complete range of solutions while demonstrating our leading position in tramway systems. Thanks to Alstom and RTA’s close collaboration on the project, Dubai’s citizens can now travel aboard one of the most sophisticated and comfortable tram in the world” said Alstom President Henri Poupart-Lafarge. 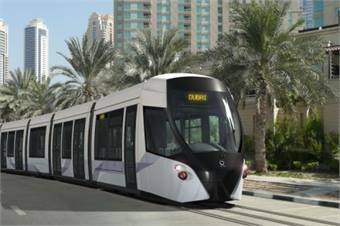 The Dubai Tramway includes many Alstom’s technological breakthroughs, according to the company. It is the first tram in the world able to run in temperatures of up to 50 °C and to withstand harsh climate conditions such as humidity and sandy atmosphere. Equipped with APS ground-level power supply, the system is also the first in the world to be catenary-free all along the six-mile line which features 11 stations2. This technology enables perfect integration of the tramway into the cityscape. Lastly, it is the first line to be equipped with air-conditioned stations and automatic platform screen doors. The Dubai Tramway is the eighth system delivered by Alstom in a decade. With seven others under implementation worldwide3 including the Lusail tram in Qatar.